Some aquatic plants will grow under some conditions all of the time. In other words, anyone who wants to can grow aquatic plants. 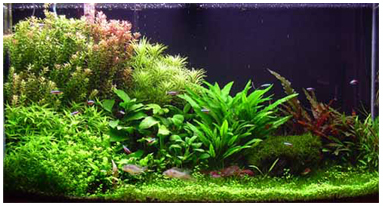 Here is the secret: Grow aquatic plants that suit the conditions of your aquarium. Know your plants. Buy a simple book about aquatic plants such as: Aquarium Plants Manual published by Barron's. This is a good and inexpensive book to get you started; available in many aquarium stores. Aquatic plants are just the same as those that grow in a garden. Some prefer lots of sun, some prefer shade, some like rich soil, others sandy, poor soil. Of course, all aquatic plants like lots of water but the beauty of that is - you don't have to water them! Calculate how many watts of light per gallon of water you have. You can grow most aquatic plants with at least 2 watts per gallon. Some will do fine with less; some will do better with more. The typical aquarium comes with one light in the hood (aquarium cover). If you would like to grow aquatic plants spend the money to get a fluorescent hood as fluorescent lighting more closely emulates the sun than does incandescent lighting. A starter tank is generally set up with a gravel substrate with or without an under-gravel filter. You will be able to grow aquatic plants either way. Medium or fine gravel is better than chunky. These will give a nice variety of leaf shape and green colours. Hornwort and the water fern can be planted or floated. Remember that floating plants block light to those underneath. Java fern and Cryptocorynes will live and grow slowly in low light. The Hygrophilias will grow quickly towards the light getting leggy and losing leaves on the lower stem. However, if they are pulled up regularly, trimmed and the tops planted back they will grow quickly enough to look good. All plants need nutrients. These can be added to the water and also come from the fish in the aquarium. Plants use carbon dioxide, ammonia and ammonium as well as nitrates as fertiliser so fish waste is well utilised. The debris that naturally accumulates in the gravel will fertilize the plant roots. A commercial fertiliser can be added at water changes. The best advice here is err on the low side. You can always add a little more. It is hard to remove once in the tank. Too many nutrients will mean algae that you don't want. Water quality makes a difference. Do you know how hard your water is? Water in the Vancouver area is generally very soft. Plants like this better than hard water but they need some minerals such as Calcium and Magnesium that affect the hardness of the water. A commercial fertiliser will add traces of these that may be adequate for your needs. Buy some fertiliser tablets for the substrate and put pieces of these around the plants, especially the Cryptocorynes. As your plants start to grow and do well you may find that some out-compete the others. You may want to eliminate one species to give more room or light to another. As you become more interested in growing aquatic plants and become more experienced you can take on the trickier varieties and use more specialised equipment. But the main thing is to have fun! And don't worry. You will be able to grow something. So you want to grow aquatic plants?